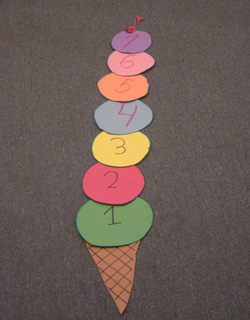 Some examples of time marking activities include the Boot Prints and Ice Cream activities. The Boot Printsactivity is created with the use of butcher paper, markers or crayons, construction paper, scissors, and a pair of the Service Member’s boots. The parent and child work together to draw the parent’s destination on one end of the butcher paper and the family’s house on the opposite end. Then the child outlines one set of boot prints for each month of the parent’s deployment (so a 12-month deployment would require 12 pairs). These boot prints are set aside in a safe place. The parent and child can hang the map in the child’s room or any acceptable location in the house. As each month of deployment passes, the child can tape a set of boot prints on the butcher paper to create a visual reminder that mom or dad is getting closer to returning home. When the deployed parent returns, the parent can help the child tape the last set of boot prints at the doorstep of the family home. If you don’t have access to butcher paper, you can draw a picture of the parent’s destination on one piece of paper and the family’s house on another, tape them to opposite ends of a wall, then just tape the boot prints directly to the wall. The Ice Cream activity is another simple time marking activity to help young children manage deployment. It also provides built-in family time, which can be fun for older children who may not be as interested in the time marking activity. The family can use construction paper to cut out a large ice cream cone and ice cream scoops of different colors and sizes. The child can hang the ice cream cone up on a wall in the kitchen or his or her bedroom. Once a month during the deployment, the family members eat ice cream together at home or at a favorite ice cream shop and share their feelings about deployment. After eating the ice cream, the child tapes one scoop of the construction paper ice cream on the cone. This serves to mark the progress through one month of deployment. When the deployed parent returns home, the entire family can enjoy ice cream together, and the child can place a cherry or special topping on top. In addition to monthly activities like Boot Prints and Ice Cream, some families choose to engage in daily or weekly rituals to help keep connections strong. One possible daily activity is reading a favorite deployment-related book every night. Books like A Paper Hug, Night Catch, Over There, and The Kissing Hand are a few excellent books that assist children in understanding and dealing with deployment. Another daily activity is using small treats to count down the days of deployment. Small treats can have a big impact on helping youngsters track time until a deployed parent returns home. Parents can purchase a special jar and help the child decorate it with paint, stickers, or markers. The jar can be filled with small treats such as Hershey kisses, jelly beans, or pretzels counted out one for each day for the length of deployment. For more than one child, you will need to multiply the number of days by the number of children participating. Each day at a specific time the children can reach into the “Mommy Jar” or “Daddy Jar” to receive a special treat. Over time the treats will become lower and lower in the jar, serving as a visual reminder that the deployed parent will be home soon. This is an excellent option for children who may have a hard time waiting all month for a big event like ice cream. It also can provide a daily opportunity for parents to check in with their children on their thoughts or feelings about deployment. Parental deployment is challenging for many youngsters, and time marking activities are just one way we can help support children experiencing deployment. For more ideas on ways to help support children during deployment, check out our website at www.focusproject.org.